This chapter introduces GATE Developer, which is the GATE graphical user interface. It is analogous to systems like Mathematica for mathematicians, or Eclipse for Java programmers, providing a convenient graphical environment for research and development of language processing software. As well as being a powerful research tool in its own right, it is also very useful in conjunction with GATE Embedded (the GATE API by which GATE functionality can be included in your own applications); for example, GATE Developer can be used to create applications that can then be embedded via the API. This chapter describes how to complete common tasks using GATE Developer. It is intended to provide a good entry point to GATE functionality, and so explanations are given assuming only basic knowledge of GATE. However, probably the best way to learn how to use GATE Developer is to use this chapter in conjunction with the demonstrations and tutorials movies. There are speciﬁc links to them throughout the chapter. There is also a complete new set of video tutorials here. applications, comprising sequences of processing resources, that can be applied to a document or corpus. What is considered to be the end result of the process varies depending on the task, but for the purposes of this chapter, output takes the form of the annotated document/corpus. Researchers might be more interested in ﬁgures demonstrating how successfully their application compares to a ‘gold standard’ annotation set; Chapter 10 in Part II will cover ways of comparing annotation sets to each other and obtaining measures such as F1. Implementers might be more interested in using the annotations programmatically; Chapter 7, also in Part II, talks about working with annotations from GATE Embedded. For the purposes of this chapter, however, we will focus only on creating the annotated documents themselves, and creating GATE applications for future use. GATE includes a complete information extraction system that you are free to use, called ANNIE (a Nearly-New Information Extraction System). Many users ﬁnd this is a good starting point for their own application, and so we will cover it in this chapter. Chapter 6 talks in a lot more detail about the inner workings of ANNIE, but we aim to get you started using ANNIE from inside of GATE Developer in this chapter. We start the chapter with an exploration of the GATE Developer GUI, in Section 3.1. We describe how to create documents (Section 3.2) and corpora (Section 3.3). We talk about viewing and manually creating annotations (Section 3.4). We then talk about loading the plugins that contain the processing resources you will use to construct your application, in Section 3.5. We then talk about instantiating processing resources (Section 3.7). Section 3.8 covers applications, including using ANNIE (Section 3.8.3). Saving applications and language resources (documents and corpora) is covered in Section 3.9. We conclude with a few assorted topics that might be useful to the GATE Developer user, in Section 3.11.
at the bottom, the messages bar. The menu and the messages bar do the usual things. Longer messages are displayed in the messages tab in the main resource viewer area. The resource tree and resource viewer areas work together to allow the system to display diverse resources in various ways. The many resources integrated with GATE can have either a small view, a large view, or both. At any time, the main viewer can also be used to display other information, such as messages, by clicking on the appropriate tab at the top of the main window. If an error occurs in processing, the messages tab will ﬂash red, and an additional popup error message may also occur. In the options dialogue from the Options menu you can choose if you want to link the selection in the resources tree and the selected main view. If you right-click on ‘Language Resources’ in the resources pane, select “New’ then ‘GATE Document’, the window ‘Parameters for the new GATE Document’ will appear as shown in ﬁgure 3.2. Here, you can specify the GATE document to be created. Required parameters are indicated with a tick. The name of the document will be created for you if you do not specify it. Enter the URL of your document or use the ﬁle browser to indicate the ﬁle you wish to use for your document source. For example, you might use ‘http://gate.ac.uk’, or browse to a text or XML ﬁle you have on disk. Click on ‘OK’ and a GATE document will be created from the source you speciﬁed. See also the movie for creating documents. The document editor is contained in the central tabbed pane in GATE Developer. Double-click on your document in the resources pane to view the document editor. The document editor consists of a top panel with buttons and icons that control the display of diﬀerent views and the search box. Initially, you will see just the text of your document, as shown in ﬁgure 3.3. Click on ‘Annotation Sets’ and ‘Annotations List’ to view the annotation sets to the right and the annotations list at the bottom. You will see a view similar to ﬁgure 3.4. In place of the annotations list, you can also choose to see the annotations stack. In place of the annotation sets, you can also choose to view the co-reference editor. More information about this functionality is given in Section 3.4. Several options can be set from the small triangle icon at the top right corner. With ‘Save Current Layout’ you store the way the diﬀerent views are shown and the annotation types highlighted in the document. Then if you set ‘Restore Layout Automatically’ you will get the same views and annotation types each time you open a document. The layout is saved to the user preferences ﬁle, gate.xml. It means that you can give this ﬁle to a new user so s/he will have a preconﬁgured document editor. Another setting make the document editor ‘Read-only’. If enabled, you won’t be able to edit the text but you will still be able to edit annotations. It is useful to avoid to involuntarily modify the original text. The option ‘Right To Left Orientation’ is useful for changing orientation of the text for the languages such as Arabic and Urdu. Selecting this option changes orientation of the text of the currently visible document. Finally you can choose between ‘Insert Append’ and ‘Insert Prepend’. That setting is only relevant when you’re inserting text at the very border of an annotation. If you place the cursor at the start of an annotation, in one case the newly entered text will become part of the annotation, in the other case it will stay outside. If you place the cursor at the end of an annotation, the opposite will happen. Text in a loaded document can be edited in the document viewer. The usual platform speciﬁc cut, copy and paste keyboard shortcuts should also work, depending on your operating system (e.g. CTRL-C, CTRL-V for Windows). The last icon, a magnifying glass, at the top of the document editor is for searching in the document. To prevent the new annotation windows popping up when a piece of text is selected, hold down the CTRL key. Alternatively, you can hide the annotation sets view by clicking on its button at the top of the document view; this will also cause the highlighted portions of the text to become un-highlighted. See also Section 20.2.3 for the compound document editor. You can create a new corpus in a similar manner to creating a new document; simply right-click on ‘Language Resources’ in the resources pane, select ‘New’ then ‘GATE corpus’. A brief dialogue box will appear in which you can optionally give a name for your corpus (if you leave this blank, a corpus name will be created for you) and optionally add documents to the corpus from those already loaded into GATE. When creating the corpus, clicking on the icon next to the “documentsList” input ﬁeld brings up a popup window with a list of the documents already loaded into GATE Developer. This enables the user to add any documents to the corpus. Alternatively, the corpus can be loaded ﬁrst, and documents added later by double clicking on the corpus and using the + and - icons to add or remove documents to the corpus. Note that the documents must have been loaded into GATE Developer before they can be added to the corpus. Once loaded, the corpus can be populated by right clicking on the corpus and selecting ‘Populate’. With this method, documents do not have to have been previously loaded into GATE Developer, as they will be loaded during the population process. If you right-click on your corpus in the resources pane, you will see that you have the option to ‘Populate’ the corpus. If you select this option, you will see a dialogue box in which you can specify a directory in which GATE will search for documents. You can specify the extensions allowable; for example, XML or TXT. This will restrict the corpus population to only those documents with the extensions you wish to load. You can choose whether to recurse through the directories contained within the target directory or restrict the population to those documents contained in the top level directory. Click on ‘OK’ to populate your corpus. This option provides a quick way to create a GATE Corpus from a directory of documents. Additionally, right-clicking on a loaded document in the tree and selecting the ‘New corpus with this document’ option creates a new transient corpus named Corpus for document name containing just this document. See also the movie for creating and populating corpora. Double click on your corpus in the resources pane to see the corpus editor, shown in ﬁgure 3.5. You will see a list of the documents contained within the corpus. In the top left of the corpus editor, plus and minus buttons allow you to add documents to the corpus from those already loaded into GATE and remove documents from the corpus (note that removing a document from a corpus does not remove it from GATE). Up and down arrows at the top of the view allow you to reorder the documents in the corpus. The rightmost button in the view opens the currently selected document in a document editor. At the bottom, you will see that tabs entitled ‘Initialisation Parameters’ and ‘Corpus Quality Assurance’ are also available in addition to the corpus editor tab you are currently looking at. Clicking on the ‘Initialisation Parameters’ tab allows you to view the initialisation parameters for the corpus. The ‘Corpus Quality Assurance’ tab allows you to calculate agreement measures between the annotations in your corpus. Agreement measures are discussed in depth in Chapter 10. The use of corpus quality assurance is discussed in Section 10.3. In this section, we will talk in more detail about viewing annotations, as well as creating and editing them manually. As discussed in at the start of the chapter, the main purpose of GATE is annotating documents. Whilst applications can be used to annotate the documents entirely automatically, annotation can also be done manually, e.g. by the user, or semi-automatically, by running an application over the corpus and then correcting/adding new annotations manually. Section 3.4.5 focuses on manual annotation. In Section 3.7 we talk about running processing resources on our documents. We begin by outlining the functionality around viewing annotations, organised by the GUI area to which the functionality pertains. To view the annotation sets, click on the ‘Annotation Sets’ button at the top of the document editor, or use the F3 key (see Section 3.10 for more keyboard shortcuts). This will bring up the annotation sets viewer, which displays the annotation sets available and their corresponding annotation types. The annotation sets view is displayed on the left part of the document editor. It’s a tree-like view with a root for each annotation set. The ﬁrst annotation set in the list is always a nameless set. This is the default annotation set. You can see in ﬁgure 3.4 that there is a drop-down arrow with no name beside it. Other annotation sets on the document shown in ﬁgure 3.4 are ‘Key’ and ‘Original markups’. Because the document is an XML document, the original XML markup is retained in the form of an annotation set. This annotation set is expanded, and you can see that there are annotations for ‘TEXT’, ‘body’, ‘font’, ‘html’, ‘p’, ‘table’, ‘td’ and ‘tr’. To display all the annotations of one type, tick its checkbox or use the space key. The text segments corresponding to these annotations will be highlighted in the main text window. To delete an annotation type, use the delete key. To change the color, use the enter key. There is a context menu for all these actions that you can display by right-clicking on one annotation type, a selection or an annotation set. If you keep shift key pressed when you open the annotation sets view, GATE Developer will try to select any annotations that were selected in the previous document viewed (if any); otherwise no annotation will be selected. Having selected an annotation type in the annotation sets view, hovering over an annotation in the main resource viewer or right-clicking on it will bring up a popup box containing a list of the annotations associated with it, from which one can select an annotation to view in the annotation editor, or if there is only one, the annotation editor for that annotation. 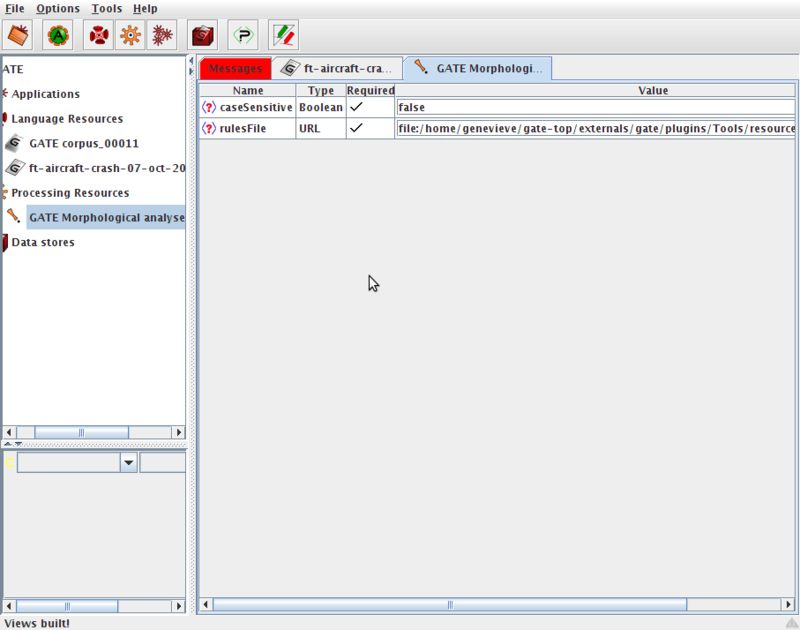 Figure 3.6 shows the annotation editor. To view the list of annotations and their features, click on the ‘Annotations list’ button at the top of the main window or use F4 key. The annotation list view will appear below the main text. It will only contain the annotations selected from the annotation sets view. These lists can be sorted in ascending and descending order for any column, by clicking on the corresponding column heading. Moreover you can hide a column by using the context menu by right-clicking on the column headings. Selecting rows in the table will blink the respective annotations in the document. Right-click on a row or selection in this view to delete or edit an annotation. Delete key is a shortcut to delete selected annotations. 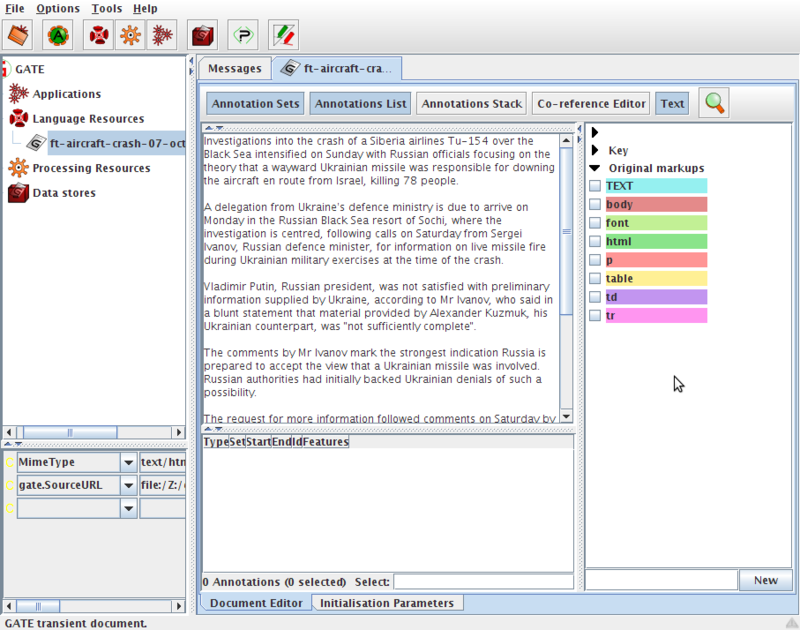 Figure 3.7: Annotations stack view centred on the document caret. This view is similar to the ANNIC view described in section 9.2. It displays annotations at the document caret position with some context before and after. The annotations are stacked from top to bottom, which gives a clear view when they are overlapping. As the view is centred on the document caret, you can use the conventional key to move it and update the view: notably the keys left and right to skip one letter; control + left/right to skip one word; up and down to go one line up or down; and use the document scrollbar then click in the document to move further. There are two buttons at the top of the view that centre the view on the closest previous/next annotation boundary among all displayed. This is useful when you want to skip a region without annotation or when you want to reach the beginning or end of a very long annotation. The annotation types displayed correspond to those selected in the annotation sets view. You can display feature values for an annotation rectangle by hovering the mouse on it or select only one feature to display by double-clicking on the annotation type in the ﬁrst column. Right-click on an annotation in the annotations stack view to edit it. Control-Shift-click to delete it. Double-click to copy it to another annotation set. Control-click on a feature value that contains an URL to display it in your browser. All of these mouse shortcuts make it easier to create a gold standard annotation set. 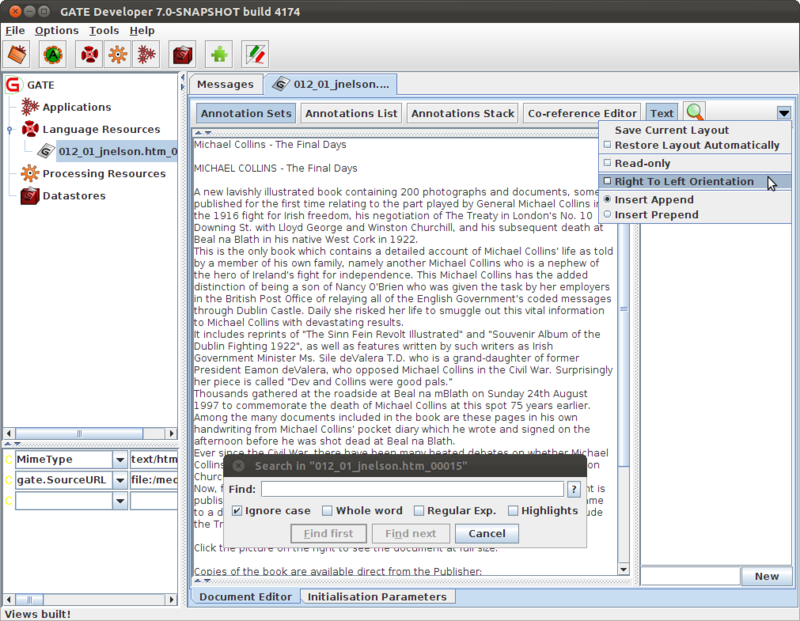 Figure 3.8: Co-reference editor inside a document editor. 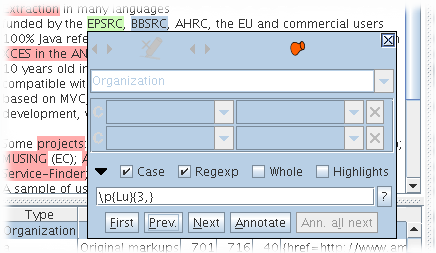 The popup window in the document under the word ‘EPSRC’ is used to add highlighted annotations to a co-reference chain. Here the annotation type ‘Organization’ of the annotation set ‘Default’ is highlighted and also the co-references ‘EC’ and ‘GATE’. The co-reference editor allows co-reference chains (see Section 6.9) to be displayed and edited in GATE Developer. To display the co-reference editor, ﬁrst open a document in GATE Developer, and then click on the Co-reference Editor button in the document viewer. The combo box at the top of the co-reference editor allows you to choose which annotation set to display co-references for. If an annotation set contains no co-reference data, then the tree below the combo box will just show ‘Coreference Data’ and the name of the annotation set. 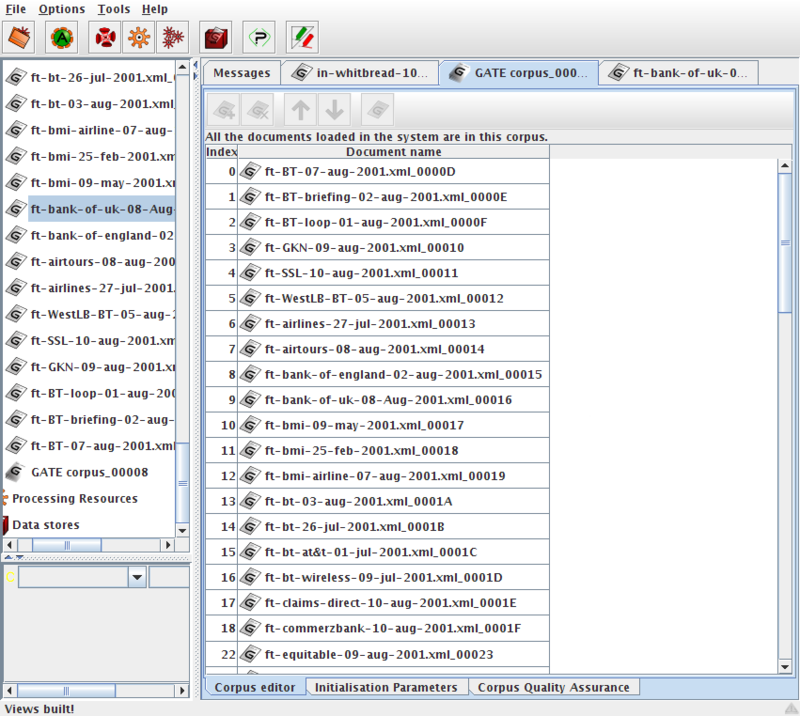 However, when co-reference data does exist, a list of all the co-reference chains that are based on annotations in the currently selected set is displayed. The name of each co-reference chain in this list is the same as the text of whichever element in the chain is the longest. It is possible to highlight all the member annotations of any chain by selecting it in the list. When a co-reference chain is selected, if the mouse is placed over one of its member annotations, then a pop-up box appears, giving the user the option of deleting the item from the chain. If the only item in a chain is deleted, then the chain itself will cease to exist, and it will be removed from the list of chains. If the name of the chain was derived from the item that was deleted, then the chain will be given a new name based on the next longest item in the chain. 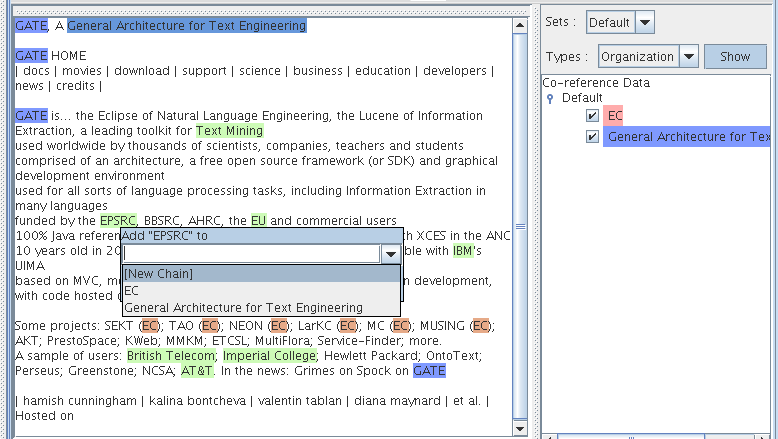 A combo box near the top of the co-reference editor allows the user to select an annotation type from the current set. When the Show button is selected all the annotations of the selected type will be highlighted. Now when the mouse pointer is placed over one of those annotations, a pop-up box will appear giving the user the option of adding the annotation to a co-reference chain. The annotation can be added to an existing chain by typing the name of the chain (as shown in the list on the right) in the pop-up box. Alternatively, if the user presses the down cursor key, a list of all the existing annotations appears, together with the option [New Chain]. Selecting the [New Chain] option will cause a new chain to be created containing the selected annotation as its only element. Each annotation can only be added to a single chain, but annotations of diﬀerent types can be added to the same chain, and the same text can appear in more than one chain if it is referenced by two or more annotations. The movie for inspecting results is also useful for learning about viewing annotations. The type of the annotation, by default, will be the same as the last annotation you created, unless there is none, in which case it will be ‘_New_’. You can enter any annotation type name you wish in the text box, unless you are using schema-driven annotation (see Section 3.4.6). You can add or change features and their values in the table below. To delete an annotation, click on the red X icon at the top of the popup window. To grow/shrink the span of the annotation at its start use the two arrow icons on the left or right and left keys. Use the two arrow icons next on the right to change the annotation end or alt+right and alt+left keys. Add shift and control+shift keys to make the span increment bigger. The red X icon is for removing the annotation. The pin icon is to pin the window so that it remains where it is. If you drag and drop the window, this automatically pins it too. Pinning it means that even if you select another annotation (by hovering over it in the main resource viewer) it will still stay in the same position. The popup menu only contains annotation types present in the Annotation Schema and those already listed in the relevant Annotation Set. To create a new Annotation Schema, see Section 3.4.6. The popup menu can be edited to add a new annotation type, however. The new annotation created will automatically be placed in the annotation set that has been selected (highlighted) by the user. To create a new annotation set, type the name of the new set to be created in the box below the list of annotation sets, and click on ‘New’. Figure 3.10 demonstrates adding a ‘Organization’ annotation for the string ‘EPSRC’ (highlighted in green) to the default annotation set (blank name in the annotation set view on the right) and a feature name ‘type’ with a value about to be added. To add a second annotation to a selected piece of text, or to add an overlapping annotation to an existing one, press the CTRL key to avoid the existing annotation popup appearing, and then select the text and create the new annotation. Again by default the last annotation type to have been used will be displayed; change this to the new annotation type. When a piece of text has more than one annotation associated with it, on mouseover all the annotations will be displayed. Selecting one of them will bring up the relevant annotation popup. 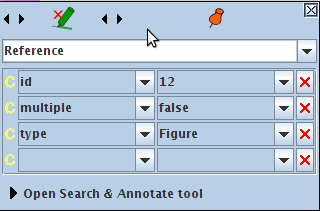 Figure 3.11: Search and Annotate Function of the Annotation Editor. Create and/or select an annotation to be used as a model to annotate. Open the panel at the bottom of the annotation editor window. Change the expression to search if necessary. Use the [First] button or Enter key to select the ﬁrst expression to annotate. Use the [Annotate] button if the selection is correct otherwise the [Next] button. After a few cycles of [Annotate] and [Next], Use the [Ann. all next] button. Note that after using the [First] button you can move the caret in the document and use the [Next] button to avoid continuing the search from the beginning of the document. The [?] button at the end of the search text ﬁeld will help you to build powerful regular expressions to search. Annotation schemas allow annotation types and features to be pre-speciﬁed, so that during manual annotation, the relevant options appear on the drop-down lists in the annotation editor. You can see some example annotation schemas in Section 5.4.1. Annotation schemas provide a means to deﬁne types of annotations in GATE Developer. Basically this means that GATE Developer ‘knows about’ annotations deﬁned in a schema. Annotation schemas are supported by the ‘Annotation schema’ language resource, which is one of the default LR types (along with corpus and document) available in GATE without the need to load any plugins. To load an annotation schema into GATE Developer, right-click on ‘Language Resources’ in the resources pane. Select ‘New’ then ‘Annotation schema’. A popup box will appear in which you can browse to your annotation schema XML ﬁle. A default set of annotation schemas for common annotation types including Person, Organization and Location is provided in the ANNIE plugin, and can be loaded by creating an Annotation schema LR from the ﬁle plugins/ANNIE/resources/schema/ANNIE-Schemas.xml in the GATE distribution. You can also deﬁne your own schemas to tell GATE Developer about other kinds of annotations you frequently use. Each schema ﬁle can deﬁne only one annotation type, but you can have a master ﬁle which includes others, in order to load a group of schemas in one operation. The ANNIE schemas provide an example of this technique. By default GATE Developer will allow you to create any annotations in a document, whether or not there is a schema to describe them. An alternative annotation editor component is available which constrains the available annotation types and features much more tightly, based on the annotation schemas that are currently loaded. This is particularly useful when annotating large quantities of data or for use by less skilled users. To use this, you must load the Schema_Annotation_Editor plugin. With this plugin loaded, the annotation editor will only oﬀer the annotation types permitted by the currently loaded set of schemas, and when you select an annotation type only the features permitted by the schema are available to edit1. Where a feature is declared as having an enumerated type the available enumeration values are presented as an array of buttons, making it easy to select the required value quickly. We suggest you to use your browser to print a document as GATE don’t propose a printing facility for the moment. First save your document by right clicking on the document in the left resources tree then choose ‘Save Preserving Format’. You will get an XML ﬁle with all the annotations highlighted as XML tags plus the ‘Original markups’ annotations set. It’s possible that the output will not have an XML header and footer because the document was created from a plain text document. In that case you can use the XHTML example below. Finally open the XML ﬁle in your browser and print it. Note that overlapping annotations, cannot be expressed correctly with inline XML tags and thus won’t be displayed correctly. 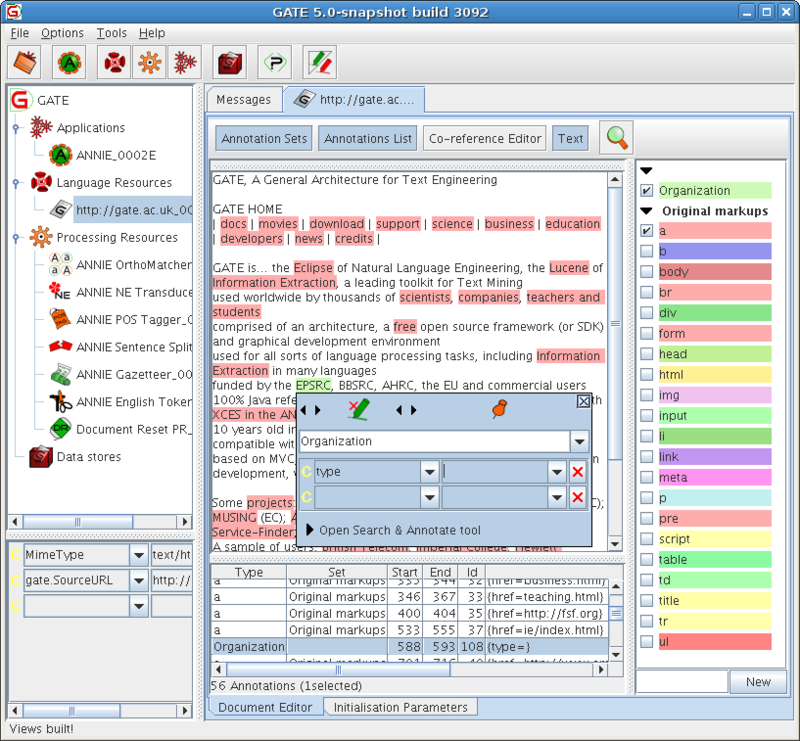 In GATE, processing resources are used to automatically create and manipulate annotations on documents. We will talk about processing resources in the next section. However, we must ﬁrst introduce CREOLE plugins. In most cases, in order to use a particular processing resource (and certain language resources) you must ﬁrst load the CREOLE plugin that contains it. This section talks about using CREOLE plugins. Then, in Section 3.7, we will talk about creating and using processing resources. The deﬁnitions of CREOLE resources (e.g. processing resources such as taggers and parsers, see Chapter 4) are stored in Maven central repository. plugins are those plugins that the system knows about. These include all the plugins: 1. default plugins provided by Gate team. 2. The plugins added by the user manually according to the Maven artifact id. 3. those installed in the user’s own plugin directory. plugins are the plugins currently loaded in the system. All CREOLE resource types from the loaded plugins are available for use. All known plugins can easily be loaded and unloaded using the user interface. plugins are the list of plugins that the system loads automatically during initialisation which can be conﬁgured via the load.plugin.path system property. are distributed with GATE to the Maven central repository. are distributed with other parties to the Maven central repository. are plugins which are loaded via http from a remote machine. Regular Maven users may have additional repositories or “mirror” settings conﬁgured in their m2/settings.xml ﬁle – GATE will respect these settings when retrieving plugins, including authentication with encrypted passwords in the standard Maven way with a master password in .m2/settings-security.xml. In particular if you have an organisational Maven repository conﬁgured as a <mirrorOf>external:*</mirrorOf> then this will be accepted and GATE will not attempt to use the Central Repository directly. The CREOLE plugins can be managed through the graphical user interface which can be activated by selecting ‘Manage CREOLE Plugins’ from the ‘File’ menu. This will bring up a window listing all the known plugins. For each plugin there are two check-boxes – one labelled ‘Load Now’, which will load the plugin, and the other labelled ‘Load Always’ which will add the plugin to the list of auto-loadable plugins. A ‘Delete’ button is also provided – which will remove the plugin from the list of known plugins. This operation does not delete the actual plugin directory. Installed plugins are found automatically when GATE is started; if an installed plugin is deleted from the list, it will re-appear next time GATE is launched. If you select a plugin, you will see in the pane on the right the list of resources that plugin contains. 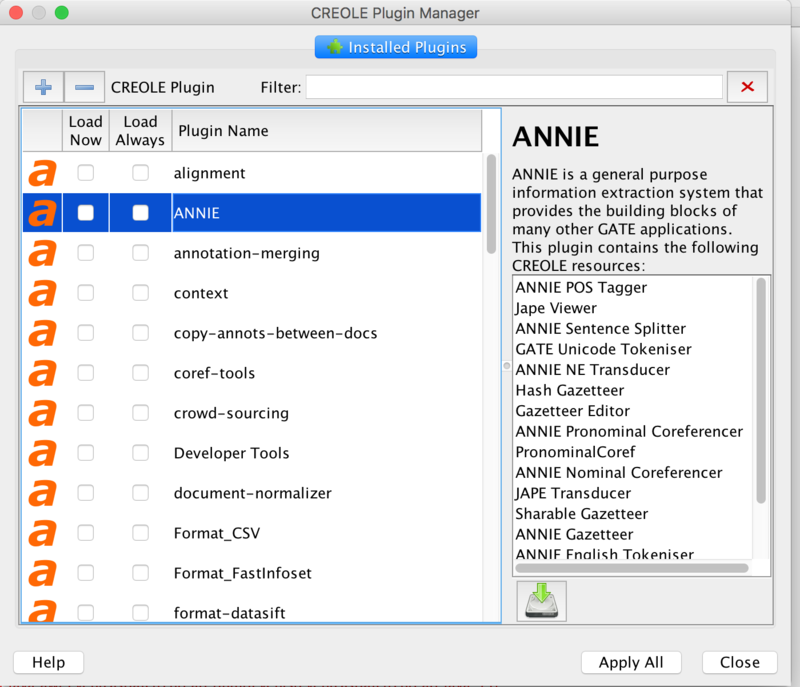 For example, in ﬁgure 3.12, the ‘ANNIE’ plugin is selected, and you can see that it contains 17 resources. If you wish to use a particular resource you will have to ascertain which plugin contains it. This list can be useful for that. Having loaded the plugins you need, the resources they deﬁne will be available for use. Typically, to the GATE Developer user, this means that they will appear on the ‘New’ menu when you right-click on ‘Processing Resources’ in the resources pane, although some special plugins have diﬀerent eﬀects; for example, the Schema_Annotation_Editor (see Section 3.4.6). Some plugins also contain ﬁles which are used to conﬁgure the resources. For example, the ANNIE plugin contains the resources for the ANNIE Gazetteer and the ANNIE NE Transducer (amongst other things). While often these ﬁles can be used straight from within the plugin, it can be useful to edit them, either to add missing information or as a starting point for delveloping new resources etc. To extract a copy of these resource ﬁles from a plugin simply select it in the plugin manager and then click the download resources button shown under the list of resources the plugin deﬁnes. This button will only be enabled for plugins which contain such ﬁles. After clicking the button you will be asked to select a directory into which to copy the ﬁles. You can then edit the ﬁles as needed before using them to conﬁgure a new instance of the appropriate processing resource. 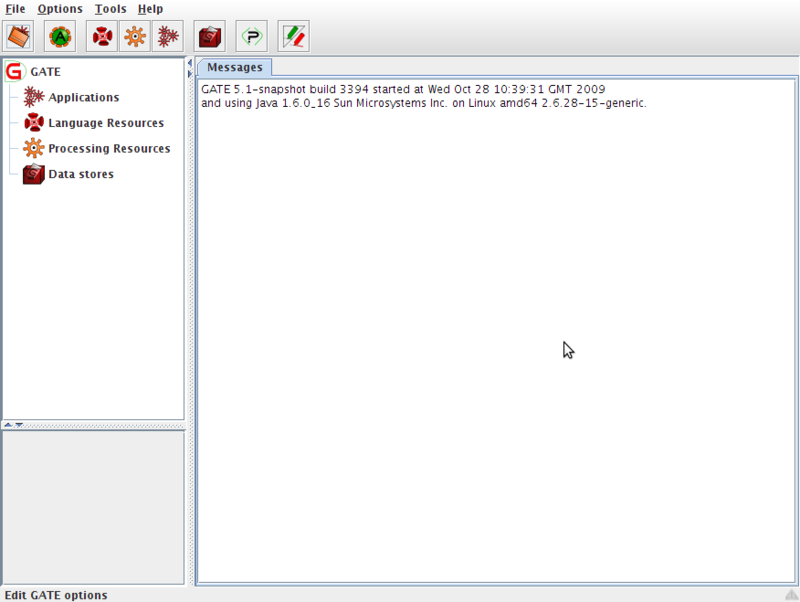 While GATE is distributed with a number of core plugins (see Part III) there are many more plugins developed and made available by other GATE users. Some of these additional plugins can easily be installed into your local copy of GATE through the CREOLE plugin manager. Installing new plugins is simply a case of checking the box and clicking ‘Apply All’. Note that plugins are installed into the user plugins directory, which must have been correctly conﬁgured before you can try installing new plugins. Once a plugin is installed it will appear in the list of ‘Installed Plugins’ and can be loaded in the same way as any other CREOLE plugin (see Section 3.7). If a new version of a plugin you have installed becomes available the new version will be oﬀered as an update. These updates can be installed in the same way as a new plugin. To register a new plugin just need simply click the ‘+’ button located at the top right corner of Plugin Manager Then you can either register a new plugin by provide the Maven Group and Artifact ID for maven plugins or provide the Dirctory URL for local or remote plugins. This section describes how to load and run CREOLE resources not present in ANNIE. To load ANNIE, see Section 3.8.3. For technical descriptions of these resources, see the appropriate chapter in Part III (e.g. Chapter 23). First ensure that the necessary plugins have been loaded (see Section 3.5). If the resource you require does not appear in the list of Processing Resources, then you probably do not have the necessary plugin loaded. Processing resources are loaded by selecting them from the set of Processing Resources: right click on Processing Resources or select ‘New Processing Resource’ from the File menu. For example, use the Plugin Console Manager to load the ‘Tools’ plugin. When you right click on ‘Processing Resources’ in the resources pane and select ‘New’ you have the option to create any of the processing resources that plugin provides. You may choose to create a ‘GATE Morphological Analyser’, with the default parameters. Having done this, an instance of the GATE Morphological Analyser appears under ‘Processing Resources’. This processing resource, or PR, is now available to use. Double-clicking on it in the resources pane reveals its initialisation parameters, see ﬁgure 3.14. This processing resource is now available to be added to applications. It must be added to an application before it can be applied to documents. You may create as many of a particular processing resource as you wish, for example with diﬀerent initialisation parameters. Section 3.8 talks about creating and running applications. See also the movie for loading processing resources. Once all the resources you need have been loaded, an application can be created from them, and run on your corpus. Right click on ‘Applications’ and select ‘New’ and then either ‘Corpus Pipeline’ or ‘Pipeline’. A pipeline application can only be run over a single document, while a corpus pipeline can be run over a whole corpus. To build the pipeline, double click on it, and select the resources needed to run the application (you may not necessarily wish to use all those which have been loaded). Transfer the necessary components from the set of ‘loaded components’ displayed on the left hand side of the main window to the set of ‘selected components’ on the right, by selecting each component and clicking on the left and right arrows, or by double-clicking on each component. Ensure that the components selected are listed in the correct order for processing (starting from the top). If not, select a component and move it up or down the list using the up/down arrows at the left side of the pane. Ensure that any parameters necessary are set for each processing resource (by clicking on the resource from the list of selected resources and checking the relevant parameters from the pane below). For example, if you wish to use annotation sets other than the Default one, these must be deﬁned for each processing resource. Note that if a corpus pipeline is used, the corpus needs only to be set once, using the drop-down menu beside the ‘corpus’ box. If a pipeline is used, the document must be selected for each processing resource used. Finally, click on ‘Run’ to run the application on the document or corpus. See also the movie for loading and running processing resources. For how to use the conditional versions of the pipelines see Section 3.8.2 and for saving/restoring the conﬁguration of an application see Section 3.9.3. To avoid loading all your documents at the same time you can run an application on a datastore corpus. To do this you need to load your datastore, see section 3.9.2, and to load the corpus from the datastore by double clicking on it in the datastore viewer. Then, in the application viewer, you need to select this corpus in the drop down list of corpora. When you run the application on the corpus datastore, each document will be loaded, processed, saved then unloaded. So at any time there will be only one document from the datastore corpus loaded. This prevent memory shortage but is also a little bit slower than if all your documents were already loaded. The processed documents are automatically saved back to the datastore so you may want to use a copy of the datastore to experiment. Be very careful that if you have some documents from the datastore corpus already loaded before running the application then they will not be unloaded nor saved. To save such document you have to right click on it in the resources tree view and save it to the datastore. The ‘Conditional Pipeline’ and ‘Conditional Corpus Pipeline’ application types are conditional versions of the pipelines mentioned in Section 3.8 and allow processing resources to be run or not according to the value of a feature on the document. In terms of graphical interface, the only addition brought by the conditional versions of the applications is a box situated underneath the lists of available and selected resources which allows the user to choose whether the currently selected processing resource will run always, never or only on the documents that have a particular value for a named feature. If the Yes option is selected then the corresponding resource will be run on all the documents processed by the application as in the case of non-conditional applications. If the No option is selected then the corresponding resource will never be run; the application will simply ignore its presence. This option can be used to temporarily and quickly disable an application component, for debugging purposes for example. The If value of feature option permits running speciﬁc application components conditionally on document features. When selected, this option enables two text input ﬁelds that are used to enter the name of a feature and the value of that feature for which the corresponding processing resource will be run. When a conditional application is run over a document, for each component that has an associated condition, the value of the named feature is checked on the document and the component will only be used if the value entered by the user matches the one contained in the document features. At ﬁrst sight the conditional behaviour available with these controller may seem limited, but in fact it is very powerful when used in conjunction with JAPE grammars (see chapter 8). Complex conditions can be encoded in JAPE rules which set the appropriate feature values on the document for use by the conditional controllers. Alternatively, the Groovy plugin provides a scriptable controller (see section 7.16.3) in which the execution strategy is deﬁned by a Groovy script, allowing much richer conditional behaviour to be encoded directly in the controller’s conﬁguration. This section describes how to load and run ANNIE (see Chapter 6) from GATE Developer. ANNIE is a good place to start because it provides a complete information extraction application, that you can run on any corpus. You can then view the eﬀects. From the File menu, select ‘Load ANNIE System’. To run it in its default state, choose ‘with Defaults’. This will automatically load all the ANNIE resources, and create a corpus pipeline called ANNIE with the correct resources selected in the right order, and the default input and output annotation sets. If ‘without Defaults’ is selected, the same processing resources will be loaded, but a popup window will appear for each resource, which enables the user to specify a name, location and other parameters for the resource. This is exactly the same procedure as for loading a processing resource individually, the diﬀerence being that the system automatically selects those resources contained within ANNIE. When the resources have been loaded, a corpus pipeline called ANNIE will be created as before. To view the results, double click on one of the document contained in the corpus processed in the left hand tree view. No annotation sets nor annotations will be shown until annotations are selected in the annotation sets; the ‘Default’ set is indicated only with an unlabelled right-arrowhead which must be selected in order to make visible the available annotations. 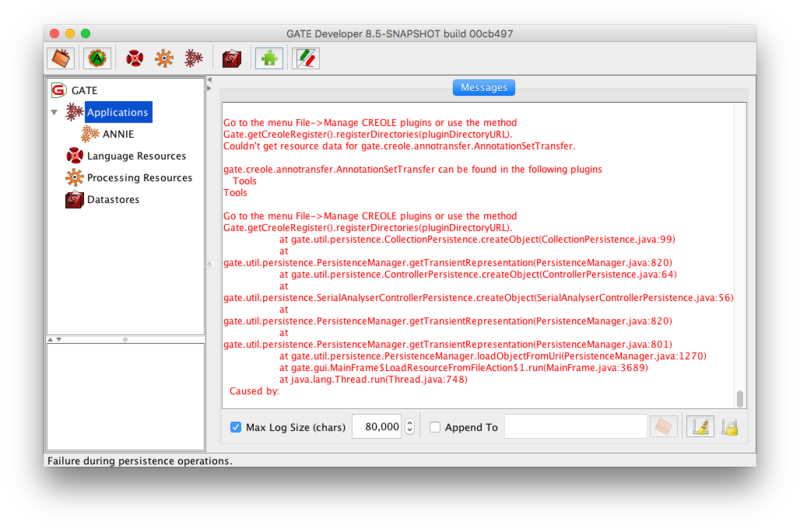 Open the default annotation set and select some of the annotations to see what the ANNIE application has done. See also the movie for loading and running ANNIE. You will need to ﬁrst make a copy of ANNIE resources by extracting them from the ANNIE plugin via the plugin manager. Once you have a copy of the resources simply locate the ﬁle(s) you want to modify, edit them, and then use them to conﬁgure the appropriate ANNIE processing resources. In this section, we will describe how applications and language resources can be saved for use outside of GATE and for use with GATE at a later time. Section 3.9.1 talks about saving documents to ﬁle. Section 3.9.2 outlines how to use datastores. Section 3.9.3 talks about saving application states (resource parameter states), and Section 3.9.4 talks about exporting applications together with referenced ﬁles and resources to a ZIP ﬁle. by writing your own dump algorithm as a processing resource. This section describes how to use the ﬁrst two options. Both types of data export are available in the popup menu triggered by right-clicking on a document in the resources tree (see Section 3.1): type 1 is called ‘Save Preserving Format’ and type 2 is called ‘Save as XML’. In addition, all documents in a corpus can be saved as individual XML ﬁles into a directory by right-clicking on the corpus in the resources tree and choosing the option ‘Save as XML‘. The ‘Save Preserving Format’ option also leads to a ﬁle dialogue; give a name and the data you require will be dumped into the ﬁle. The action can be used for documents that were created from ﬁles using the XML or HTML format. It will save all the original tags as well as the document annotations that are currently displayed in the ‘Annotations List’ view. This option is useful for selectively saving only some annotation types. The annotations are saved as normal document tags, using the annotation type as the tag name. If the advanced option ‘Include annotation features for “Save Preserving Format”’ (see Section 2.5) is set to true, then the annotation features will also be saved as tag attributes. Using this operation for GATE documents that were not created from an HTML or XML ﬁle results in a plain text ﬁle, with in-line tags for the saved annotations. Note that GATE’s model of annotation allows graph structures, which are diﬃcult to represent in XML (XML is a tree-structured representation format). During the dump process, annotations that cross each other in ways that cannot be represented in legal XML will be discarded, and a warning message printed. Where corpora are large, the memory available may not be suﬃcient to have all documents open simultaneously. The datastore functionality provides the option to save documents to disk and open them only one at a time for processing. This means that much larger corpora can be used. A datastore can also be useful for saving documents in an eﬃcient and lossless way. To save a text in a datastore, a new datastore must ﬁrst be created if one does not already exist. Create a datastore by right clicking on Datastore in the left hand pane, and select the option ‘Create Datastore’. Select the data store type you wish to use. Create a directory to be used as the datastore (note that the datastore is a directory and not a ﬁle). You can either save a whole corpus to the datastore (in which case the structure of the corpus will be preserved) or you can save individual documents. The recommended method is to save the whole corpus. To save a corpus, right click on the corpus name and select the ‘Save to...’ option (giving the name of the datastore created earlier). To save individual documents to the datastore, right clicking on each document name and follow the same procedure. To load a document from a datastore, do not try to load it as a language resource. Instead, open the datastore by right clicking on Datastore in the left hand pane, select ‘Open Datastore’ and choose the datastore to open. The datastore tree will appear in the main window. Double click on a corpus or document in this tree to open it. To save a corpus and document back to the same datastore, simply select the ‘Save’ option. See also the movie for creating a datastore and the movie for loading corpus and documents from a datastore. Resources, and applications that are made up of them, are created based on the settings of their parameters (see Section 3.7). It is possible to save the data used to create an application to a ﬁle and re-load it later. To save the application to a ﬁle, right click on it in the resources tree and select ‘Save application state’, which will give you a ﬁle creation dialogue. Choose a ﬁle name that ends in gapp as this ﬁle dialog and the one for loading application states age displays all ﬁles which have a name ending in gapp. A common convention is to use .gapp or .xgapp as a ﬁle extension. To restore the application later, select ‘Restore application from ﬁle’ from the ‘File’ menu. Note that the data that is saved represents how to recreate an application – not the resources that make up the application itself. So, for example, if your application has a resource that initialises itself from some ﬁle (e.g. a grammar, a document) then that ﬁle must still exist when you restore the application. In case you don’t want to save the corpus conﬁguration associated with the application then you must select ‘<none>’ in the corpus list of the application before saving the application. The ﬁle resulting from saving the application state contains the values of the initialisation and runtime parameters for all the processing resources contained by the stored application as well as the values of the initialisation parameters for all the language resources referenced by those processing resources. Note that if you reference a document that has been created with an empty URL and empty string content parameter and subsequently been manually edited to add content, that content will not be saved. In order for document content to be preserved, load the document from an URL, specify the content as for the string content parameter or use a document from a datastore. If the property gate.user.resourceshome is set to the path of a directory and the resource is located inside that directory but the state ﬁle is saved to a location outside of this directory, the path is stored relative to this directory and the path marker $resourceshome$ is used. in all other situations, the path is stored relative to the location of the application state ﬁle location and the the path marker $relpath$ is used. References to resources inside GATE plugins are stored as a special type of URI of the form creole://group;artifact;version/path/inside/plugin. In this way, all resource ﬁles that are part of plugins are always used corretly, no matter where the plugins are stored. Resource ﬁles which are not part of a plugin and used by an application do not need to be in the same location as when the application was initially created but rather in the same location relative to the location of the application ﬁle. In addition if your application uses a project-speciﬁc location for global resources or project speciﬁc plugins, the java property gate.user.resourceshome can be set to this location and the application will be stored so that this location will also always be used correctly, no matter where the application state ﬁle is copied to. To set the resources home directory, the -rh location option for the Linux script gate.sh to start GATE can be used. The combination of these features allows the creation and deployment of portable applications by keeping the application ﬁle and the resource ﬁles used by the application together. If your application uses resources from inside plugins then those resources may change if you upgrade your application to a newer version of the plugin. If you want to upgrade to a newer plugin but keep the same resources you should export a copy of the resource ﬁles from the plugin onto disk and load them from there instead of using the plugin-relative defaults. When an application is restored from an application state ﬁle, GATE uses the keyword $relpath$ for paths relative to the location of the gapp ﬁle and $resourceshom$ for paths relative to the the location the property gate.user.resourceshome is set. There exists other keywords that can be interesting in some cases. You will need to edit the gapp ﬁle manually. You can use $sysprop:...$ to declare paths relative to any java system property, for example $sysprop:user.home$. If you want to save your application along with all plugins and resources it requires you can use the ‘Export for GATE Cloud’ option (see Section 3.9.4). See also the movie for saving and restoring applications. When you save an application using the ‘Save application state’ option (see Section 3.9.3), the saved ﬁle contains references to the plugins that were loaded when the application was saved, and to any resource ﬁles required by the application. To be able to reload the ﬁle, these plugins and other dependencies must exist at the same locations (relative to the saved state ﬁle). While this is ﬁne for saving and loading applications on a single machine it means that if you want to package your application to run it elsewhere (e.g. deploy it to GATE Cloud) then you need to be careful to include all the resource ﬁles and plugins at the right locations in your package. The ‘Export for GATE Cloud’ option on the right-click menu for an application helps to automate this process. When you export an application in this way, GATE Developer produces a ZIP ﬁle containing the saved application state (in the same format as ‘Save application state’). Any plugins and resource ﬁles that the application refers to are also included in the zip ﬁle, and the relative paths in the saved state are rewritten to point to the correct locations within the package. The resulting package is therefore self-contained and can be copied to another machine and unpacked there, or passed to GATE Cloud for deployment. Maven-style plugins will be resolved from within the package rather than being downloaded at runtime from the internet. All plugins that are loaded at the point when you perform the export will be included in the resulting package. Use the plugin manager to unload any plugins your application is not using before you export it. If your application refers to a resource ﬁle that is in a directory on disk rather than inside one of the loaded plugins, the entire contents of this directory will be recursively included in the package. If you have a number of unrelated resources in a single directory (e.g. many sets of large gazetteer lists) you may want to separate them into separate directories so that only the relevant ones are included in the package. The packager only knows about resources that your application refers to directly in its parameters. For example, if your application includes a multi-phase JAPE grammar the packager will only consider the main grammar ﬁle, not any of its sub-phases. If the sub-phases are not contained in the same directory as the main grammar you may ﬁnd they are not included. If indirect references of this kind are all to ﬁles under the same directory as the ‘master’ ﬁle it will work OK. If you require more ﬂexibility than this option provides you should read Section E.2, which describes the underlying Ant task that the exporter uses. Some of the changes introduced in GATE 8.5 mean that applications saved with a previous version of GATE might not load without being updated. Loading such an application is likely to result in errors similar to those seen in Figure 3.15. In order to load such application into GATE 8.5 (or above), you need ﬁrst upgrade them to use compatible versions of the relevant plugins. In most cases this process can be automated and we provide a tool to walk you through the process. To start upgrading an application select ‘Upgrade XGapp’ from the ‘Tools’ menu. This will ﬁrst ask you to choose an application ﬁle to upgrade and will then present the UI shown in Figure 3.16. One the application has been analysed the tool will show you a table in which each row signiﬁes a plugin used by the app. In the left most column it lists the plugin currently referenced by the application. This is followed by details of the new plugin. While in most cases the tool can correctly determine the right plugin to oﬀer in this column you can correct any mistakes by double-clicking the incorrect plugin and then specifying the correct plugin location. The ﬁnal two columns determine if the plugin is upgraded and to which version. The versions oﬀered are all those which are available and known to be compatible with the version of GATE you are running. By default the latest available version will be selected, although -SNAPSHOT versions are only selected by default if you are also running a -SNAPSHOT version of GATE. The ‘Upgrade’ column allows you to determine if and how a plugin will be upgraded. The three possible choices are Upgrade, Plugin Only, and Skip. Skip is fairly self explanatory but upgrade and plugin only require a little more explanation. Upgrade means that not only will the plugin location be upgraded, but also any resources that reside within the plugin will also be changed to reference those within the new plugin. This is the only upgrade option when considering a plugin which was originally part of the GATE distribution. The plugin only option allows you to change the application to load a new version of the plugin which leaving the resource locations untouched. This is useful for cases where you have edited the resources inside a plugin rather than having created a separate copy speciﬁc to the application. After upgrade, the old version of the application ﬁle will still be available but will have been renamed by adding the ’.bak’ suﬃx. In most cases this upgrade process will work without issue. If, however, you ﬁnd you have an application which fails to open after the upgrade then it maybe because one or more plugins couldn’t be correctly mapped to new versions. In these cases the best option is to revert the upgrade (replace the xgapp ﬁle with the generated backup), load the application into GATE 8.4.1 and then use the “Export for GATE Cloud” option to produce a self contained application (see Section 3.9.4). Then ﬁnally run the upgrade tool over this version of the application. The two buttons at the top of the dialog allow you save and restore the mappings deﬁned in the table. This makes it easier to upgrade a set of related applications which should all be upgraded in a similar fashion. Note that this process is not limited simply to upgrading applications saved prior to GATE 8.5 but can be used at any time to upgrade the version of a plugin used by an application. You can use various keyboard shortcuts for common tasks in GATE Developer. These are listed in this section. GATE can remember Developer options and the state of the resource tree when it exits. The options are saved by default; the session state is not saved by default. This default behaviour can be changed from the ‘Advanced’ tab of the ‘Conﬁguration’ choice on the ‘Options’ menu (or the ‘Preferences’ option on the ‘GATE’ application menu on Mac). though the directory name may be in your local language if your copy of Windows is not in English. When you create a document from a URL pointing to textual data in GATE, you have to tell the system what character encoding the text is stored in. By default, GATE will set this parameter to be the empty string. This tells Java to use the default encoding for whatever platform it is running on at the time – e.g. on Western versions of Windows this will be ISO-8859-1, and Eastern ones ISO-8859-9. On Linux systems, the default encoding is inﬂuenced by the LANG environment variable, e.g. when this variable is set to en_US.utf-8 the default encoding used will be UTF-8. You can change the default encoding used by GATE to UTF-8 by adding -Dfile.encoding=UTF-8 to the gate.l4j.ini ﬁle. A popular way to store Unicode documents is in UTF-8, which is a superset of ASCII (but can still store all Unicode data); if you get an error message about document I/O during reading, try setting the encoding to UTF-8, or some other locally popular encoding. 1Existing features take precedence over the schema, e.g. those created by previously-run processing resources, are not editable but are not modiﬁed or removed by the editor. 2Gorey details: features of annotations and documents in GATE may be any virtually any Java object; serialising arbitrary binary data to XML is not simple; instead we serialise them as strings, and therefore they will be re-loaded as strings.